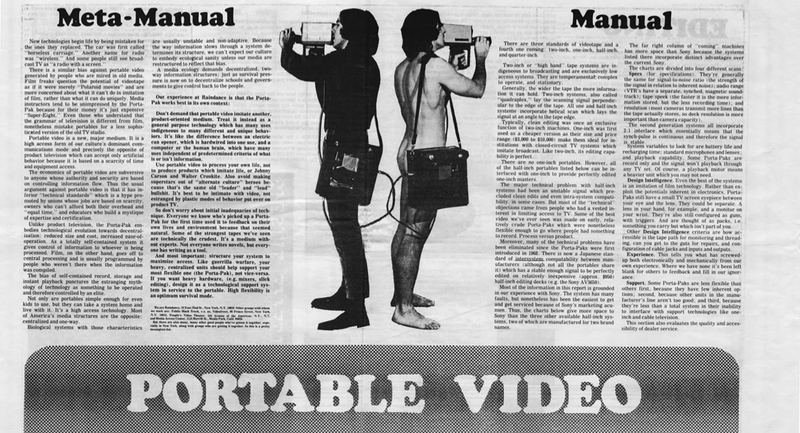 In the latter 1960s, the socially-transformative, radical surge of the counter-culture movement met head-on with the birth of a new technological medium: portable video. More precisely, it was the Sony DV-2400 Video Rover (known as the Portapak), which was introduced to the market in 1967, making its way into the hands of artists, alternative documentarians, media collectives, and activists: essentially undermining and rupturing the centralized nature of traditional broadcast television. The emerging video movement coalesced in 1970 around the first video publication, Radical Software, a new alt-magazine that functioned as a print-based communications hub for an international scene of wildly experimental practitioners. 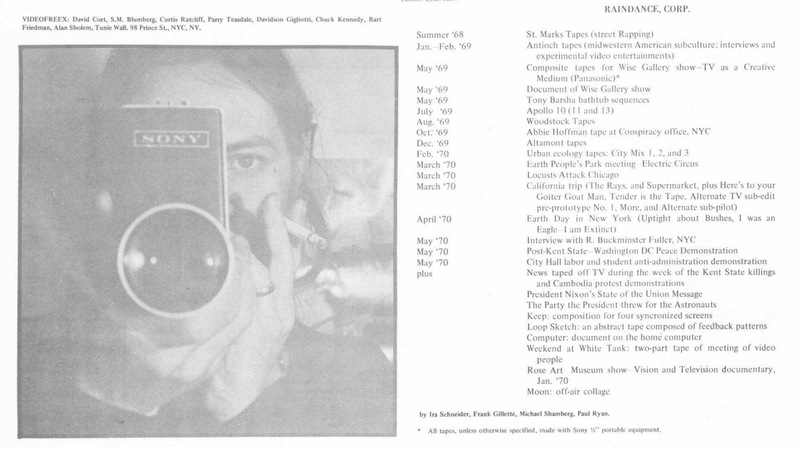 Radical Software was the brainchild of Beryl Korot and Phyllis Gershuny, and fueled by a supporting cast of artists and filmmakers including Ira Schneider, Frank Gillette, Michael Shamberg, et al. 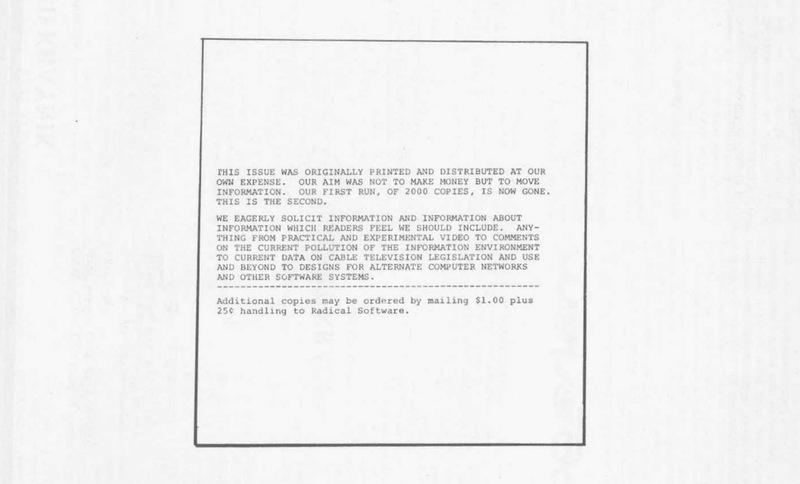 The 11 limited edition issues of Radical Software were edited and distributed between 1970 and 1974, essentially chronicling the rise of early video history, when a grass roots movement around the world was in the early stages of understanding the potential of how video would become the dominant new media. 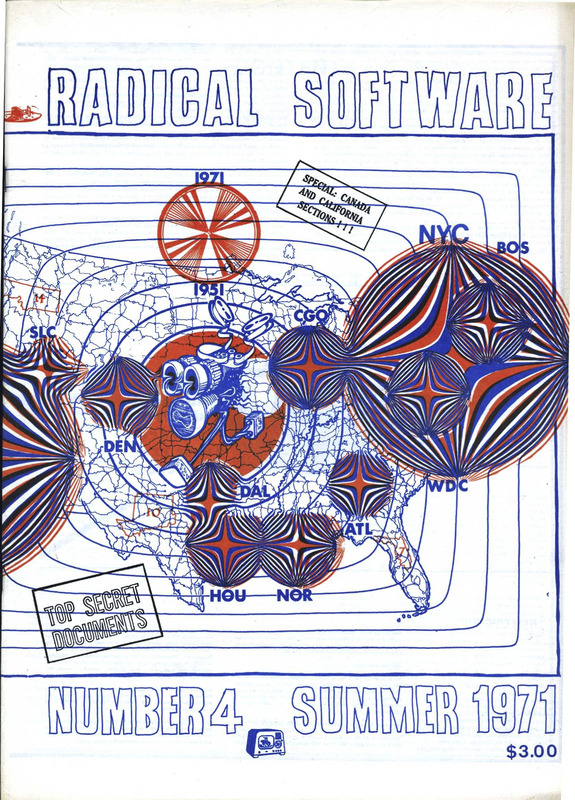 Radical Software was the hub of a growing network of media collectives that included Raindance, Videofreex, People’s Video Theater, Global Village, among others: inspired and activated by the far-flung possibilities of what video could be in the hands of artists, communities, activists, and everyday people. Radical Software, like Stewart Brand’s Whole Earth Catalog, was designed in a home-spun format, presenting itself as a call-to-action, rallying community activism, media education, radical theory, and artistic experimentation. Many of the visionary bright lights of the time wrote for Radical Software, which served as a kind of underground academic journal for new theories and ideas that were perhaps too radical for mainstream publications. A taste of essays includes: Expanded Cinema author Gene Youngblood’s Videosphere, declaring “Television is the software of the Earth”, which included the manifesto, The Media Must Be Liberated; social architect R. Buckminster Fuller was represented with Software, a “pirated transcription of an interview by Raindance Corporation”; and pioneering video artist Nam June Paik wrote Expanded Education for the Paperless Society, advocating a media revolution in higher education. And these essays were all published in the first issue! So, video as software? Yes, in fact Radical Software co-editor Beryl Korot viewed video media as enabling a new kind of programming, through the entire process of filming, recording, editing, and manipulating the video signal to the final tape. Video, as opposed to hierarchically-constructed high-end network television, was about giving everyone the freedom of making, designing, reconfiguring, and altering new electronic imagery to create their own narrative. Thus video became a new software platform in the hands of those who found their way to transform the experience of television in radically new ways. 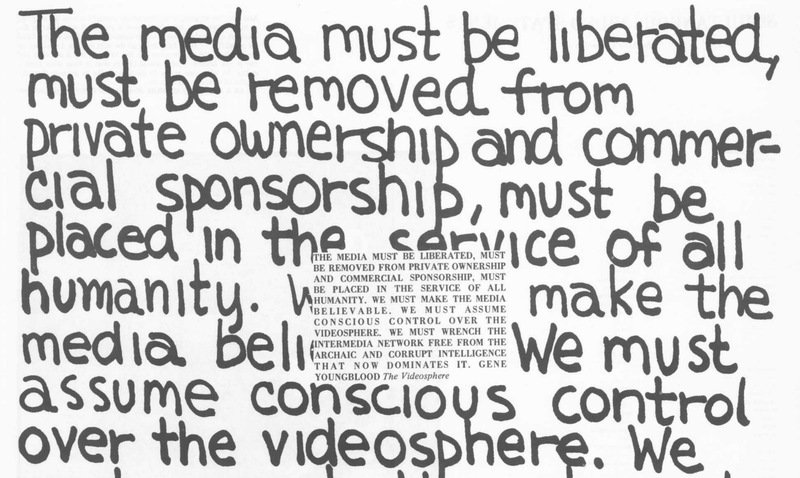 Video became the medium of the counter-culture: affordable, accessible technology that fit perfectly into 1960s/70s communal living, resource sharing, socially-engaged collectivism, political action, media hacking, pirate broadcasting, guerrilla theater, Happenings, psychedelia, and all the rest. These were radical times and video was the currency of the moment, the organizing principle for new electronic communications: years before the Internet and the World Wide Web became mainstream. With Radical Software, video became a tool for empowerment, the realization of a new media ecology that connected people, not just a distribution mechanism for delivering content to the television set. As Beryl Korot describes, “there was a certain kind of social responsibility that we felt towards one another.” Radical Software was the original Craig’s List for video, you could find anyone there, it was social media of the 1970s, it was a medium for instigating collaboration, new enterprise, educational and health initiatives, and artistic projects. As we peer back from our 21st century vantage point, where nearly everyone has a video camera in their smart phone, when Facebook is a global medium with a vast web of interconnections, when nothing seems radical or new anymore because information is rushing all the time at the speed of light. Looking back at Radical Software, there is something precious, almost nostalgic about this historical period when there were less than one hundred video practitioners in the world, when you could fit everything and everyone in the video world into a few magazine issues, and when a small press ‘zine could alter the media landscape. There is much to be learned from Radical Software, it reveals to us that technology is really about the ecology of people creating, connecting, and working together towards common goals. It reminds us that media technology is a powerful tool when it serves our social and political needs, rather than the commodity-driven aspirations of the technology industry. It also reminds us that while today we have social media tools that in the 1970s would have been unimaginable, are we really using them: radically?